Currently Out Of Stock Color, wash and color again and again. 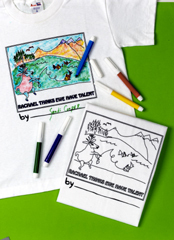 These wonderful Rachael Vega ® Coloring Tees make wonderful party favors or gifts. Express EWErself! !